Asset managed by Cimarron Hospitality, Four Points Dallas Arlington Entertainment District, previously under the name Holiday Inn Express Arlington Six Flags, offers 102 spacious guest rooms, over 750 sq. ft. of meeting space, a 24-hour fitness center and business center. Marriott International, Inc. today announced the opening of Four Points Dallas Arlington Entertainment District. Catering to the needs of today's everyday traveler, the hotel offers approachable design, stylish comfort and all the brand's popular extras including a 24-hour fitness center, heated pool, fast and free Wi-Fi throughout the hotel, and the Best Brews & BBQ™ program, detailed below. 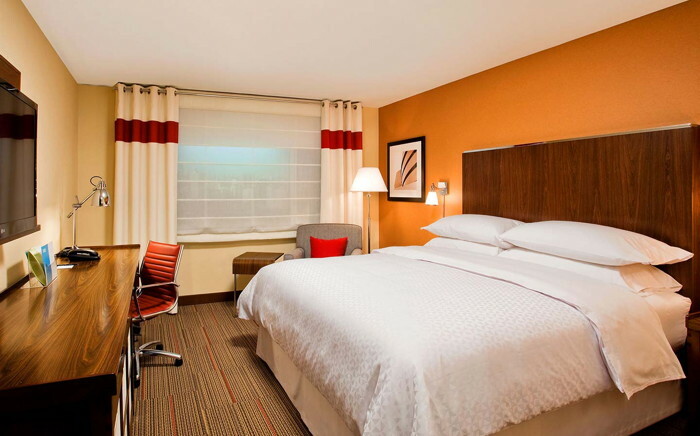 Asset managed by Cimarron Hospitality, Four Points Dallas Arlington Entertainment District, previously under the name Holiday Inn Express Arlington Six Flags, offers 102 spacious guest rooms, over 750 sq. ft. of meeting space, a 24-hour fitness center, business center and fast and free Wi-Fi throughout the hotel. Guests will enjoy full-service dining at the hotel pub and the brand's iconic Best Brews and BBQ program, which serves guests refreshing, curated local beers and seasonal BBQ-style appetizers. Deep Ellum IPA from Deep Ellum Brewery is the Best Brew at Four Points Dallas Arlington Entertainment District. Four Points Dallas Arlington Entertainment District is just a short drive from Six Flags Over Texas, AT&T Stadium, and Globe Life Park. It is also within driving distance of both Dallas and Fort Worth and is roughly eight miles from DFW Airport (DFW) for a convenient trip. "Designed with the everyday traveler in mind, Four Points Dallas Arlington Entertainment District will be a convenient stay for anyone looking to enjoy the world-class attractions of Arlington," said Callette Nielsen, Vice President & Global Brand Manager of Courtyard, Fairfield, Four Points, and SpringHill Suites. "Accessible to families and business travelers alike, the friendly design of the property will make anyone's stay comfortable." Owner of the Four Points Dallas Arlington Entertainment District, Rohit Dand, stated, "We are honored to be an exciting addition to the Marriott International Family by bringing the fast growing Four Points brand to the Arlington Entertainment District. We look forward to welcoming guests to our hotel and continuing our tenured relationship with Marriott International!